As promised, here’s information on the items I’d like to include in my book that I need help tracking down information on. These short writings were so helpful to me that I’d like to put them in an Appendix at the back of my book so readers can have them handy instead of having to track them down. Using Google I found this page for Mr. Cobb, but I’m not sure it’s the same person. I’ll email him after I post this blog entry. Again, if anyone out there has more concrete information on this item, please leave a comment below. And lastly, I would like to include a transcript of a portion of an interview given by poet Robert Bly. He was being interviewed by Bill Moyers in a video titled A Gathering of Men, distributed by Mystic Fire Videos. I’ve found three phone numbers for Mystic Fire Videos, two are disconnected, and one was a wrong number. Robert Bly has his own website (www.robertbly.com), but there’s no contact information listed. Most websites have a default email address for the webmaster, usually in the format webmaster@website.com and I’ve sent an email there, but no response as of yet. Again, if anyone can help me find out who I need to contact please leave a comment below. Autobiography in Five Short Chapters: I heard back from Beyond Words Publishing and have received permission to reprint in the US and Canada, working on getting international reprint rights. 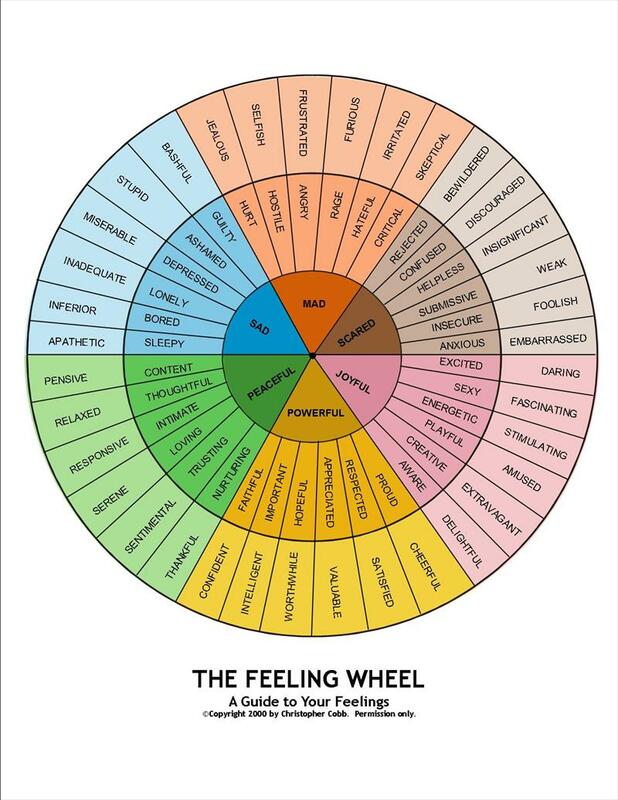 The Feeling Wheel: I heard back from Christopher Cobb who explained that his webmaster had posted the Feeling Wheel erroneously attributed to him. It was taken down when they caught the mistake but copies of it are still floating around the internet. He believed it was created by someone in Florida – which would back up the info I found on Gloria Wilcox – but I haven’t had any luck finding more contact info for her. There are a ton of women with the same name, and I can’t even say for sure that she still lives in Florida. So I still could use help getting info on who to contact regarding the Feeling Wheel. Robert Bly: It appears the default webmaster account for his website is disabled, as my email came back rejected. Google didn’t have any helpful results when I searched for “Robert Bly’s agent”. I emailed www.poetryfoundation.org to ask if they had any contact info for either Mr. Bly or his agent. On their page for Mr. Bly they mentioned some of his recent work, I’ll try tracking down who published those works. If nothing else I figure they ought to have recent contact information for Mr. Bly or his agent. I managed to get in touch with someone at Harper Collins who gave me the phone number for Mr. Bly’s literary agent. Still no response from Dr. Wilcox, so I used an online search tool to track down a possible phone number for her. I’ll try calling them both on Monday. I got some GREAT news! I heard back from the Beyond Words Publishing and they granted me permission to add Portia Nelson’s Autobiography in Five Short Chapters to my book’s Appendix. One step closer to my goal. It’s been a very busy week at work, completely forgot to call Mr. Bly’s agent, but I did call the number I found for Dr. Wilcox. It was a wrong number but the lady who answered (who has the same name) said that she moved into the area eight years ago and the people at her church knew of Dr. Wilcox. The lady gave me the name and phone number of her church, I might get lucky and find out where she works now, etc. Again, one step at a time. It’s been a long time since I’ve updated the blog but quite a bit has happened. I got in touch with Mr. Bly’s agent who informed me that the rights to interviews are usually held by the interviewer, so I contacted Mr. Moyers’ organization and notified them. I finally worked out permission with Random House for Thich Nhat Hahn’s Hope As An Obstacle (from his book called Peace Is Every Step) – that was the most difficult process of any I’ve been through. Apparently Max Ehrmann’s Desiderata is now in the public domain, and I’ve run out of leads for The Feeling Wheel. I plan to include it in my book with a note asking readers to help me trace down the original author. Next up: formatting the book for eReaders and getting it out there! I haven’t updated this in a long time. In December 2012 a reader commented below to share that Dr. Wilcox’s Feeling Wheel was published in her book “Feelings: Converting Negatives to Positives”. In the spring of 2013 I tracked that book back to its publisher, Morris Publishing and they did give me a PO Box address for Dr. Wilcox. Unfortunately I never got a response. I also tried calling the church (mentioned above) but no one there seemed to know who she was. Ironically, I’ve had two more people contact me about Dr. Wilcox in the last week after a year of silence on the matter. Someone who has a copy of my book believes she might be a member of their church and said they’d see if they could locate her for me. I also got an email from another author seeking to reprint Dr. Wilcox’s Feeling Wheel. More to come. I’ve finally gotten in touch with Dr. Willcox! I spoke to her for a few moments on the phone this morning, told her about my book and requested permission to reprint. She gave me her email address and asked that I send a request there and she’d reply with permission. I forgot to mention that other authors were seeking her contact info but I included that in my email and asked if I could share it with others. I’ll update this when I hear back from her. Dr. Willcox replied to me that I can share her email with anyone else trying to reach her. If you’re interested in doing so, place a comment here or send me a message from the Contact Me page. Dr. Gloria Willcox is the original creator of The Feeling Wheel. Look for her book, “Feelings:Converting Negatives to Positives,” which is self-published. Thank you for the information! I’ll look into it. Hi Louann, and thank you for your comment. It depends on what search terms you’re using. In some searches I’m the top result. What terms were you searching for on Google? As far as building backlinks, it’s true that would definitely help. Unfortunately I’m just one person doing this in my spare time. Finding other bloggers in recovery who want to cross-blog has been more difficult than I would’ve expected and I only have so much free time. I try to spend a few hours on this every 2-3 months when I can carve out the time. I don’t publish it all on the blog yet because some of what I’m putting together is material for either another book or that I can put into an app that I can publish alongside the book. May I ask what brought you to the blog? Hi Rob. I got your email and have replied. Thank you for helping us with permissions from Dr. Wilcox’s wonderful tool. I am developing a new counseling model for lawyers, the Integrative Client-Centered Model (ICCM), and the Feelings Wheel is a great tool for bringing the idea of “feelings” to lawyers. Please send me Dr. Wilcox’s email address. Mark, I’ve sent it over. Check your email. I as well would love Dr. Wilcox’s email address as I’d love permission to use her feelings wheel in my workbook for wives recovering after betrayal from their husband’s sexual addiction. Thank you so much! Hi Shelley. I’ve sent it, check your email. Can you please also send me Dr. Wilcox’s email address? I appreciate your help! Hi George. I’ve sent it, check your email. Hi Denise. I’ve received your email from my Contact page and replied to it, check your mail. Hi Carol. I’ve replied to your email, it should be in your inbox shortly. Hi! i am also interested in obtaining Dr. Wilcox’s email address in order to inquire about permission to use her chart. Thank you! I appreciate your help very much. Hi Maralynn. I’ve replied to your email, it should be in your inbox shortly. Hello, I would love to have Dr. Wilcox email as I would like to be able to print an extra large version to use with a children’s grief group. Thank you.